Thirteen men, four of them from Rockland, graduated from O&R’s Gas Operator Technician program Aug. 10 at the Orange County Fire Training Center in New Hampton. After the graduation, O&R held a job fair at the site to introduce the grads to prospective employers. Pictured here, from left, are: Dave Walsh of Garnerville, Matt Rose of West Haverstraw and Freddie DeVivo of Nanuet. They are discussing job openings with Bruce Smith, right, of Environmental Construction in Stony Point. PEARL RIVER — Thirteen men unemployed and underemployed men graduated recently from a three-week, natural gas operator technician training course sponsored by O&R. It may be the break that changes their lives for the better. 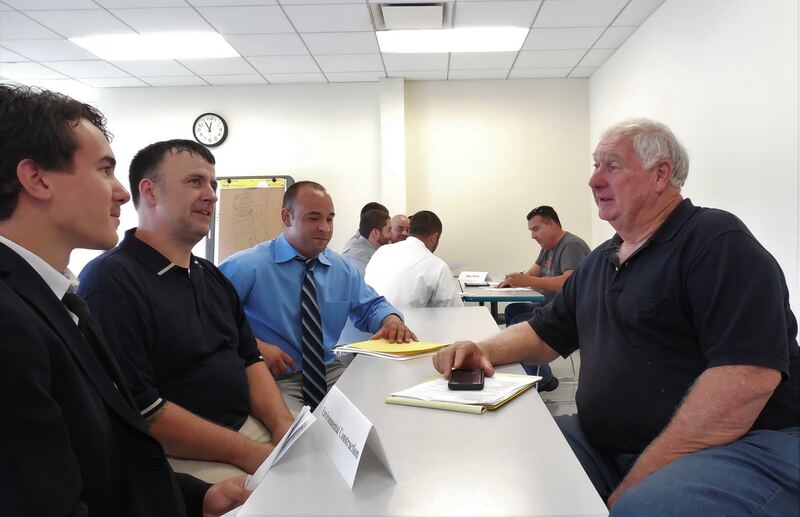 As part of a graduation ceremony held at the Orange County Fire Training Center in New Hampton, O&R also sponsored a job fair designed to introduce private natural gas pipeline construction companies to new graduates of the gas operator technician training course. These openings are not at O&R but with the many private construction industry contractors in the area. The introduction renews the labor pool for the private contractors and offers the opportunity for a job to the graduates. O&R is offering the program to broaden the labor pool of qualified natural gas pipeline technicians being sought after by private construction contractors for the many infrastructure rehabilitation and renewal projects under way or on the drawing board. For more information about how to sign up or other details about the program, contact O&R’s Program Administrator Patricia Kelly by email at Kellypa@oru.com.